SUSEs Hackweek 8 allowed me to implement support for LVM thin-provisioned snapshots in snapper. Since thin-provisioned snapshots themself are new I will shortly show their usage. Unfortunately openSUSE 12.2 RC1 does not include LVM tools with thin-provisioning so you have to compile them on your own. First install the thin-provisioning-tools. Then install LVM with thin-provisioning enabled (configure option –with-thin=internal). To setup LVM we first have to create a volume group either using the LVM tools or YaST. I assume it’s named test. Then we create a storage pool with 3GB space. Now we can create a thin-provisioned logical volume named thin with a size of 5GB. The size can be larger than the pool since data is only allocated from the pool when needed. Finally we can create a snapshot from the logical volume. Space for the snapshot is also allocated from the pool when needed. The command lvs gives an overview of the allocated space. After installing snapper version 0.0.12 or later we can create a config for the logical volume thin. As a simple test we can create a new file and see that snapper detects its creation. # snapper -c thin create --command "touch /thin/lenny"
So now you can use snapper even if you don’t trust btrfs. Feedback is welcomed. 28 Partitions on a Single Disk? No Problem! So far it was only possible to have upto 16 device nodes for a single disks. This restricted the number of usable partitions. As a workaround kpartx could be used to create device mapper mappings for further partitions but that was never fully integrated in openSUSE. 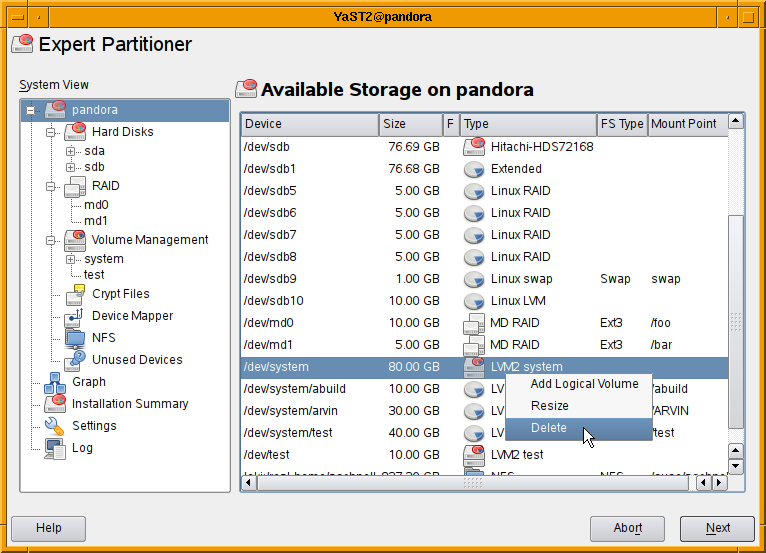 With version 2.6.28 the kernel supports upto 256 device nodes per disk, much more than the partition table allows. But since the implementation is not straightforward, the additional device nodes are assigned dynamically, user-space programs may need to be adapted. For openSUSE 11.2 Milestone 5 YaST was extended to support this new kernel feature. Some quick tests showed only problems with LVM. If you are interested in this feature and have the possibility please give it a try so that we find remaining bugs. Libstorage is a C++ library for managing Linux storage devices. So far it was developed as part of YaST but since a few weeks it is an independent project. Here is a code example creating a 1GB partition on /dev/sdb. // Create 1GB partition on /dev/sdb and format it with Ext4. // Set mount-point to "/home" and fstab option to "relatime". // Set filesystem label to "HOME" and mount filesystem by label. // format and mount it and update /etc/fstab. Besides of hard-disks libstorage handles RAID, LVM, NFS, various filesystems and encryption. Swig generated Python bindings are also provided. Libstorage has no dependencies on YaST, neither for building nor runtime. We hope libstorage will also be useful for other projects. More information is available in the openSUSE Wiki, including a list of useful features people would love to see implemented in the near future. available via context menus in the main view listing all devices. With openSUSE 11.1 on the road we developers can use some time for new ideas. One idea on my mind for month was to show the dependencies of storage devices in a graph. 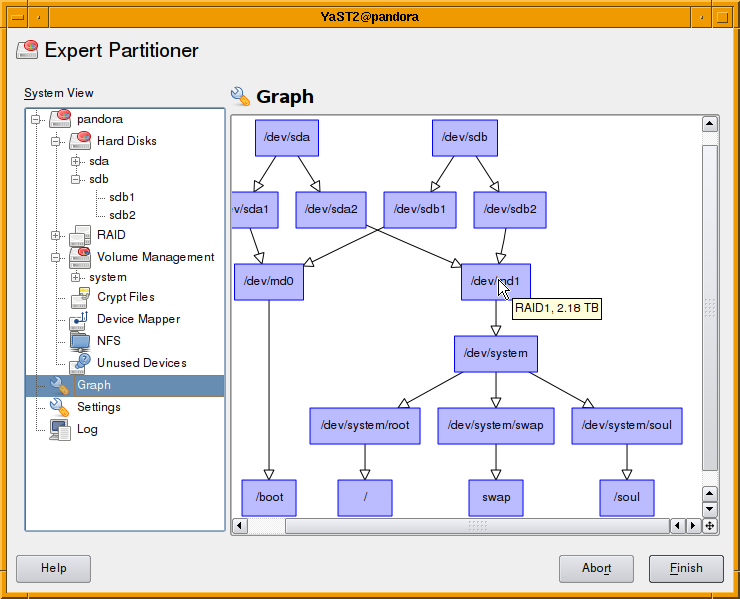 Using graphviz and QGraphicsScene a first version was running within few days. Use different shapes and colors for different devices types. Will be available in Factory within the next weeks. Further improvements are welcome. 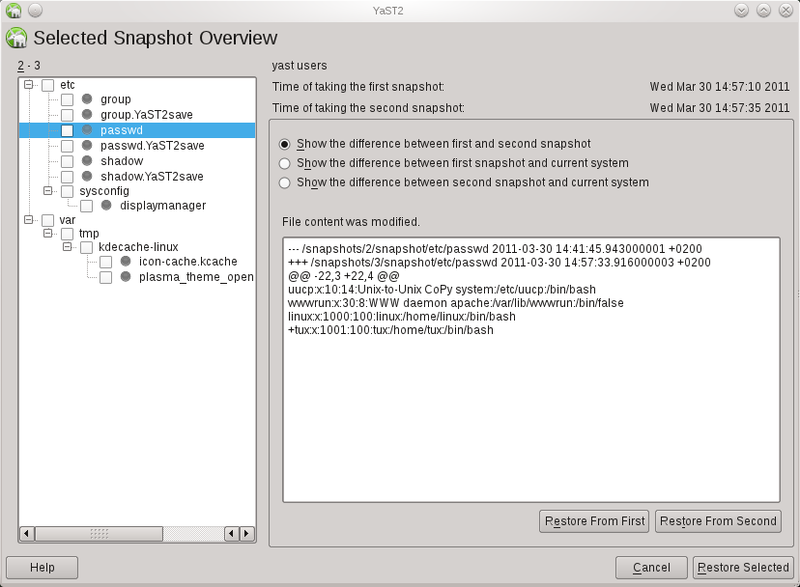 We are redesigning the YaST Expert Partitioner for openSUSE 11.1 and SLE11. The main idea is to have a navigation tree with all available storage devices on the left side and to display information on the right side along with buttons to perform appropriate actions. See the screenshot. RPMs are available in the openSUSE Build Server in the repository home:aschnell. They are far from finished by you can already navigate in the tree and inspect you storage system. It should be possible to see where we are heading with the redesign. 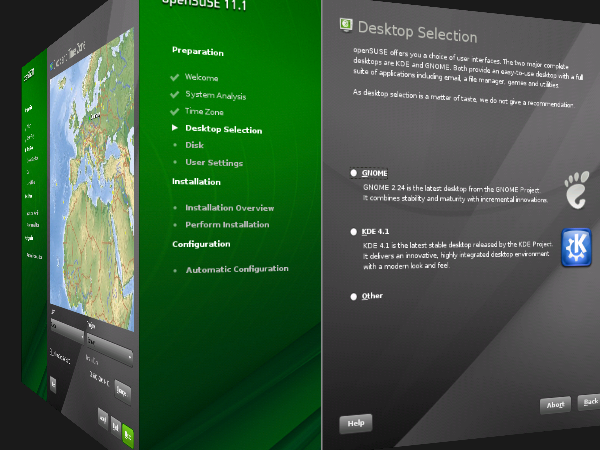 You can install them on your openSUSE 11.0 Beta 3.